Data is everywhere. From every click on the internet to our text messages and purchases; data is constantly being collected, stored and analysed. The majority of businesses understand that if they capture all the data that streams into their company, they can get significant value from it. Data allows businesses to gain a thorough understanding of their performance and to produce analytics that provide the insight to make informed, strategic decisions; resulting in both a competitive advantage and valuable knowledge of clients. 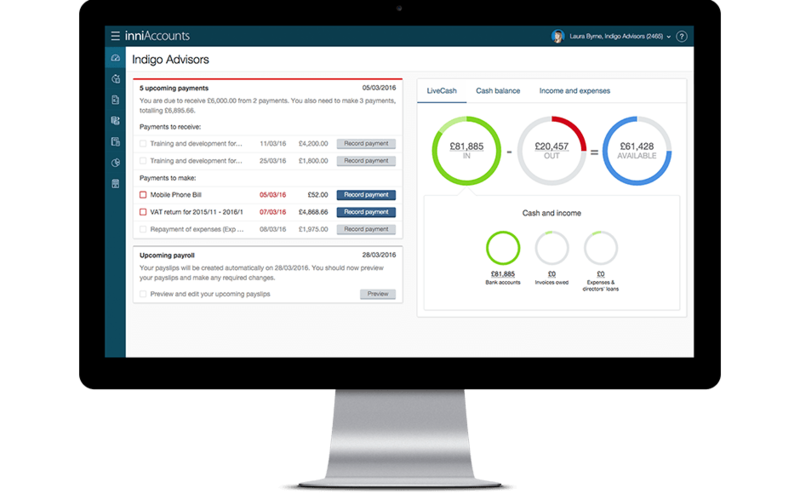 Here at inniAccounts, across every facet of our business from marketing and software development through to client services, we use a wide array of data to inform us of our performance and lead our future innovations. For many businesses, data comes at the cost of someone having to spend a lot of time pulling various numbers out of a heap of databases before stitching it all together into a coherent report that business leaders will understand. We’ve certainly been there. There was a time when all our reports were created through access to databases built with Excel. We would manually have to go in and create reports from scratch every time they were needed. With the sheer amount of data in our company, reports were often overcomplicated and difficult to interpret. Simply put, it was labour intensive, time-consuming and didn’t provide the answers as quickly as we needed them. Innovation’s our bread and butter, so we knew with the right technology there had to be a simpler and cheaper way to harness our data. I was tasked with finding a solution and implementing it throughout the company. A method for automating our figures and streamlining the process, so our data was always on hand and could be easily understood. What I found was Power BI. Power BI is a set of tools that allows non-technical folks to perform the kinds of analytics previously reserved for techies. Any analyst can connect to a data source and quickly summarise their findings into a simple report; no programming required. If you have even a rudimentary understanding of Excel, Power BI comes naturally. With it, we’ve eliminated the time-consuming manual loading of data into Excel. The vast majority of our reports are now entirely automated and constantly updating. They’re clear, easy to understand, consistent across the company and we’ve reduced errors. We can quickly make changes to answer any newly raised questions and consistently have a precise picture of our company’s performance in all departments. As well as our internal databases, we’re hooked up to MailChimp, Sendgrid, Google Analytics, Facebook, LinkedIn and Wufoo, just to name a few. Power BI allows us to filter, sort and modify data so we can limit the input to only seeing the exact numbers we’re asking for. Previously, sharing reports was limited to emailing around Excel sheets, which, when you’re busy, often get put on the backburner. Power BI allows us to embed live reports to any web page, so the stats are right there in front of you in an attractive, readable format. We started implementing in December and have already rolled Power BI out to everyone at inni. They can now individually tailor reports to suit their needs; no more waiting on a single member of the team to produce the reports for them. With every person able to look at the figures and answer specific questions about our clients and performance, we’re seeing a growth in fresh ideas – fuelling the innovation that’s always driven our business. It wasn’t completely smooth sailing, however. Linking up to local databases needed constant reviews and rehashing (each source has their own little quirks) and given the nature of our company we needed to ensure all sources were secure. I’ve had to put in place standard layouts and codes of practice to ensure consistency company-wide. inni’s always believed in the power of data and as such our company has harnessed a huge amount of information. We’ve had to step back and re-evaluate the reasons behind our standard reports to ensure we’re driven by relevant data. For me personally, getting to grasp with the flow of data in our company and how all our sources interlink has been both fascinating and a challenge. But without a doubt it’s been worthwhile. Now you’ll find our Power BI dashboard on the screen in almost every meeting, leading the way in understanding our business and what comes next. Power BI is a great innovation that can revolutionise how your company uses data, reducing the manual labour traditionally involved and allowing a far cheaper alternative to expensive and often out-dated business intelligence software. We’ve found that clear data lets businesses foresee problems, develop solutions, understand their clients as well as their internal workings and innovate for success. Want to know a little more about innovation at inniAccounts? Take a look at our recent blog articles.